How do I register in the webshop? In the top menu bar, go to the text link "Log in," which takes you to the login form. 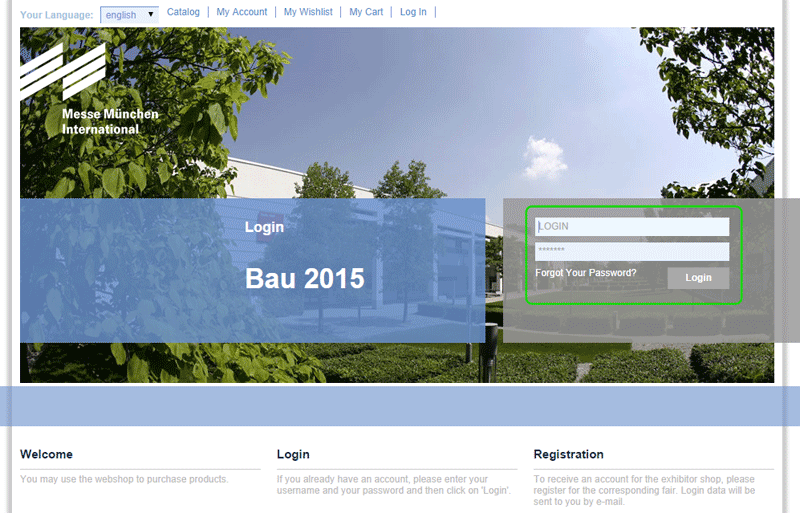 At the login screen, you can sign in with your user's email address and the respective password. If you have several booths at a trade show, after login, the system will ask you for which booth you wish to place an order. Select your booth in the respective dialog box and confirm with "next" - you will be redirected to the main page of the shop catalog. 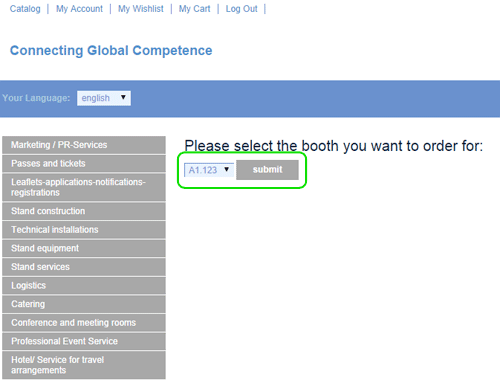 If you have only one booth at the exhibition, you will not be prompted for the booth query but be redirected directly the main page following input of login data. When do I need to authenticate? Authentication is necessary if you want to place orders and make changes to your account. 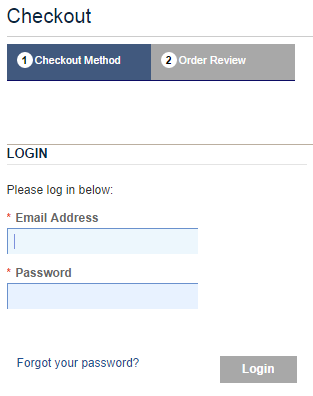 If you have added items to your shopping cart in the shop but have not yet signed in, a form will show up at completion of the order which provides the option to log in retroactively. You must be signed in to place orders. Are there any special provisions for exhibitors who have several stands at the same exhibition? If you operate several booths, be sure that you place your order for the correct booth(s). After signing in, you will be prompted to select the booth for which you would like to order. Please make sure to complete the order process before changing to another booth/customer! The order of all items in the shopping cart will always be effected for the currently selected booth/customer. Can I authorize also other users to place orders in my name and for my account? 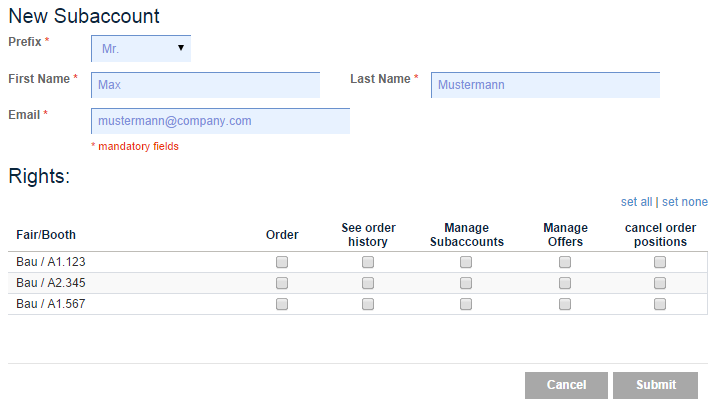 Sub-accounts are a means to authorize [enable] your employees to place orders on your behalf. Since sub-accounts are linked to the booth, new sub-accounts must be created for each event. It should be noted here that a separate account is created in the system for each booth. If, in this sample view, the sub-account of John Doe is responsible for managing the booths A1/123, A2/345 and A1/567, he will be listed three times in the overview, once for each booth. When you create a new sub-account, you can determine which rights that person has for each booth, by ticking the appropriate authorization boxes. Can I still see my orders after the order process has been completed? You can view all orders in the customers [clients] menu (accessible via "My account") under the menu item "My orders". The link "view order" takes you to the order details. Here you can see all information about the respective order. To put an item on the wishlist, click on the link "Add to wishlist" located directly underneath the "Add to cart" button. How can I convert items saved in the wish-list into an order? In the header line, go to "My wishlist/shopping list" to access your wishlist. 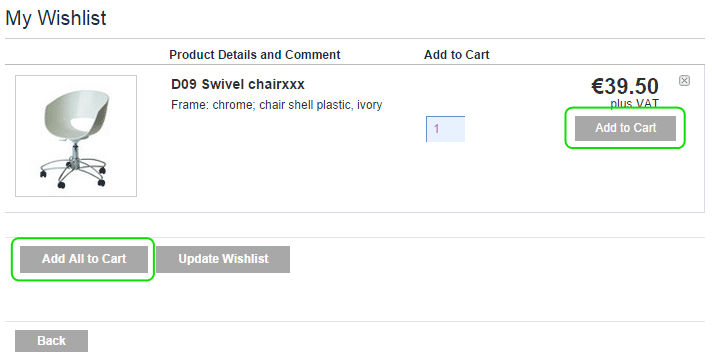 Here, you can move items from the wishlist into your shopping cart for ordering, either by clicking on "Add to cart" for individual articles, or by clicking "Add all to cart" to transfer the complete list of earmarked items into shopping cart. What are the system requirements/settings for my Internet browser? You can use the webshop with current versions of Internet Explorer, Firefox, and Google Chrome. Internet Explorer is supported from version 8 onward. Can I cancel a whole order or individual items? In the detailed order list (accessible via "My account" and then "My orders") you will see a text link "request cancellation". Via this link, you can submit a request to the supplier for an order cancellation. Whether cancellation is still possible depends on the terms and conditions of the supplier. Depending on the status, the cancellation request might be disabled in the system, for example when an article has already been shipped or delivered, or if a specific time window has been exceeded. In such cases, the cancellation request link in the order details is hidden. 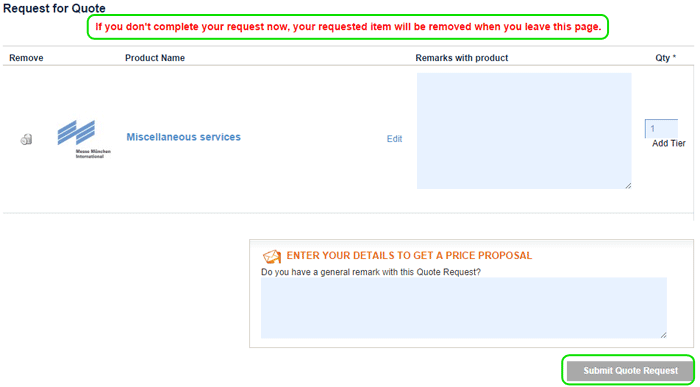 How do I order products/items marked "on request"? 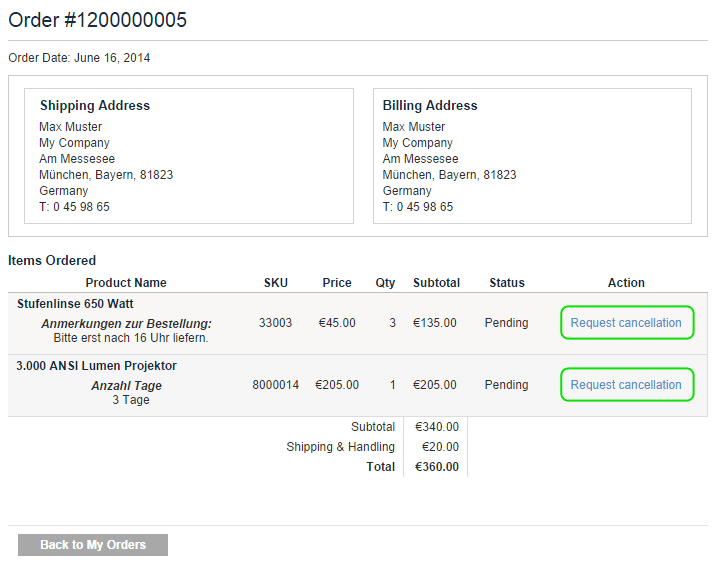 Some products cannot be ordered directly from the supplier. This might be the case because the product is currently not available, the official order deadline has expired, or because it is a special service, which requires additional planning steps on the supplier side first. For these products, you can send a request to the supplier. The supplier will draft a quote based on this request, including the required quantity of items and price. You can reject or accept this offer, turning it into an order in a subsequent step. When you submit a product/price request, this process is not represented in the shopping cart view, as happens with regular purchases, but is processed in parallel with normal orders. It is therefore important that a request be completed before proceeding with your normal order. If you interrupt the request process and leave the page to continue with your regular order, the request and any saved data will be lost. You can view your requests and the respective quotes received by suppliers under "My account" in the menu item "My quotes". How can I track the status of a whole order or individual items? I am at a loss, who can help me? For any questions, please contact our support team, either by email at shop@bau-muenchen.com or by phone at +49 89 949 11308. Why can't I change the payment settings? Payments are currently not processed via the shop. Hence, there is no need to change the settings. Why can't I change the shipping address? Shipping addresses are provided from other Messe München internal data bases. Editing shipping addresses via the webshop is not planned at this time. Please contact our support if you need to make changes. Why can't I see all webshop items after login? If you don't have a booth at the selected event, you won't be shown an order list either. The system furthermore distinguishes between main and co-exhibitors as customer groups. The range of products that co-exhibitors can order is limited. What is a sub-account? Why did I get a (only one) sub-account? Sub-accounts can be set-up in addition to your main account, as a means to authorize other employees to place orders independently. Learn more about sub-accounts by referring to question 4: "Can I authorize also other users to place orders in my name and for my account?" I have registered for the trade fair, why can't I place an order? New accounts are not created immediately after login in the webshop. Only after the confirmation of the stand proposal, a user may order from his or her account.